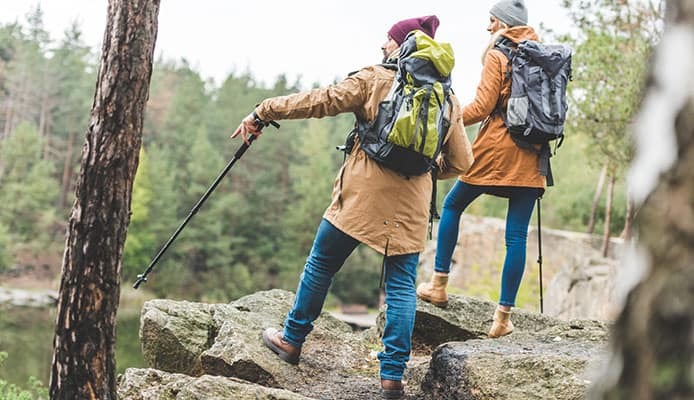 The secret to staying warm and comfortable even during wintertime, whether you’re just roaming the city or off on a hiking trip, is layering. Placing 3 layers in a particular order on yourself can make you impermeable to any kind of weather, and keep you as warm as you’d be indoors. Out of all three layers, the middle one is the most important for retaining heat. 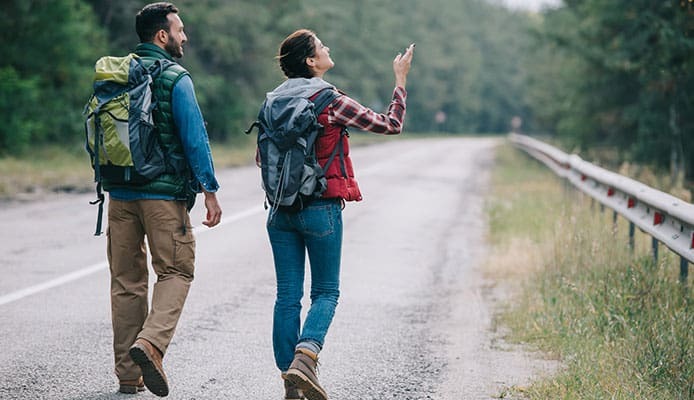 In this buying guide, we will give you a quick overview of the best mid layer jackets you can find, as well as explain how this insulation layer works and how to pick one. Especially if you’re engaged in some high-energy sports outdoors (like skiing, snowboarding, hiking etc. ), a reliable mid layer fleece is essential. If you get too hot, you can just remove it, while still keeping the waterproof top coat. So, without further ado, here are the best midlayer options on the market. It’s not just our opinion: most of the midlayer reviews rate this jacket as the best layering option for men. It’s lightweight and non-bulky, but surprisingly warm, just like a heavy pullover would normally be. Made from 100-weight sweater fleece, it’s perfect for keeping you warm and comfortable. The special flatlock seams provide you with increased comfort during movement, and you don’t need to worry anymore about chaffing. Also, the DriClime lined collar will protect you from moisture seeping inside your jacket. Any kind of water drops are wicked out, and the collar itself is designed to prevent scratching and any irritating feeling. This top-rated mid layer jacket is perfect for everyday use, like strolls through town or commuting during winter time. It also comes with a zippered chest pocket that provides convenient storage for your important valuables. The stylish color block design and the lightweight fleece makes this the best mid layer jacket for urban wear during winter. Still, if you put a reliable waterproof top coat, you can still use it as a mid layer for backpacking and simple outdoor trips. It’s very thin, making the warmth it provides quite a pleasant surprise. You don’t have to be a Predators fan to be in love with how the pullover will make you feel. The top-rated mid layer jacket is made of polyester-based heather yarn DIE and the anti-static and moisture-draining qualities it provides are flawless. It’s mechanically stretched, which means you will get a very comfortable fit. An officially licensed NHL product, it’s the best midlayer for those with a strong fashion sense. A great mid layer for skiing or city exploring (everyday wear), this warm jacket from Levelwear comes with several remarkable advantages. First of all, its composition includes a bit of spandex in addition to the usual polyester which most of the best midlayer jackets contain. That means it will be a greater, closer fit with a stretchy feel, without compromising on its insulation properties. Second of all, this is one of the best snowboard mid layers on the market. The tightly draped collar comes with a generous dip of zipper, allowing you to snug it tightly around yourself underneath your top coat, but also to rearrange your clothing often. Since snow and cold can usually enter your under-layers through the loose collar when on a snow sports trip, this is a huge pro for the model. It also makes it a great mid layer for skiing. 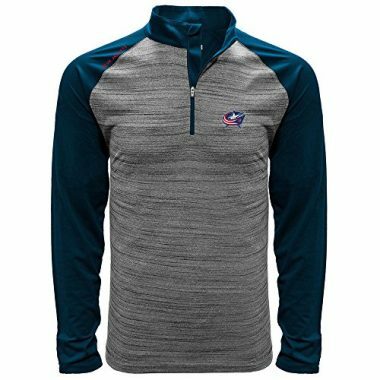 An affordable quarter zip item, this Levelwear NCAA item is the best mid layer jacket for keeping warm in urban conditions and everyday travel. It’s lightweight, easy to pull on and off, and its design allows you to showcase your support for the mobility team. The touch of this top-rated mid layer jacket is fabulously soft and quality-based, in spite of how thin and lightweight the fabric seems. It’s based on polyester 100% so it can deliver all the warmth and insulation we’ve come to expect. The loose fit of the Levelwear mid layer fleece makes it a great piece to wear around on your daily errands in the cold season. A mid layer jacket that looks good enough to be worn as an outside coat as well, this Yukon Gear men’s mid layer is a great addition to your winter wardrobe. Its design is in the military camouflage-style, with two color themes to choose from. 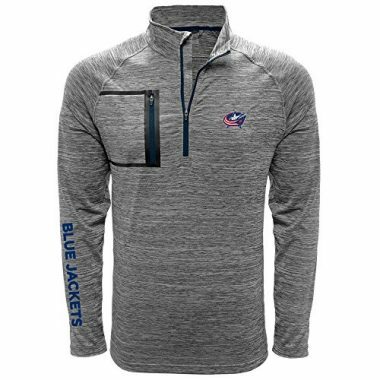 It features two zipped hand pockets and a welded chest pocket, so your valuables will be secure at all times. The Yukon Gear men’s fleece is one of the higher-end products the market offers. If you’re looking for the best mid layer jacket money can buy, this one is definitely worth the investment. 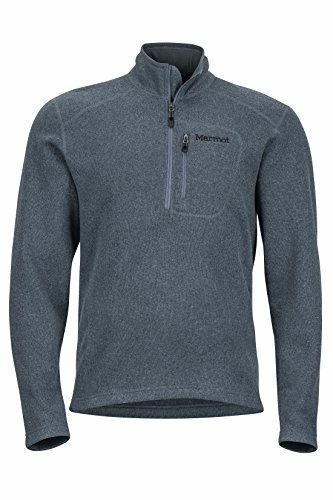 The fleece fabric is softer, more breathable and more silent compared to any other you’ve tried wearing. Also, the sleeves feature wrist cuffs that can be adjusted to ward off the cold in a great-fitting manner. 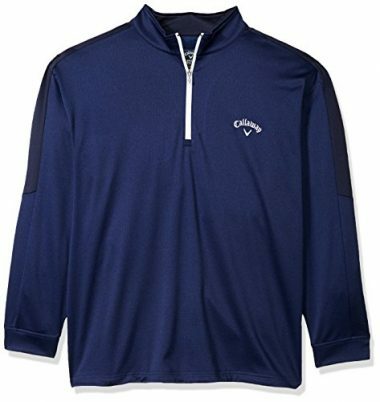 A high-performance fleece item, this top-rated mid layer jacket from Callaway is ideal for snow sports. Not only it will protect you from the cold and the wind, but it also features a comfortable solar protection of UPF 50. This means that the UVA and UVB rays can’t harm you while you’re out snowboarding or skiing. You can, of course, wear it even while exploring your urban surroundings on a winter’s day. The Opti-Therm technology makes its insulation great, and the Opti-Stretch technology make it fit to your form perfectly. It’s been tested not to restrict your range of movement at all, which means it’s also the best midlayer for golf and similar finesse outdoor activities. 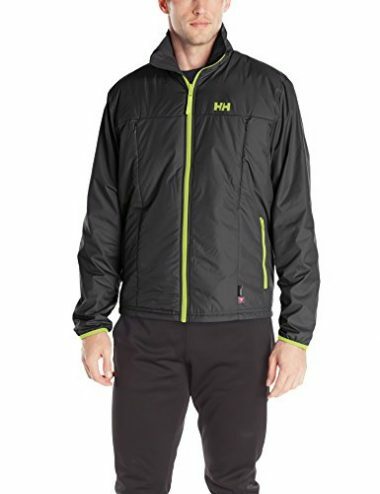 This Helly Hansen jacket is one of the best midlayer options for urban exploring and daily travel, but also for camping in winter. It comes with elongated cuffs which you can put around your thumb, making sure no area of your wrist remains exposed. Stick you hands in a pair of warm gloves next and you’re all set to go exploring. 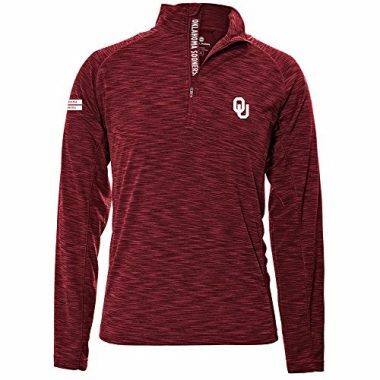 The Air Channel SlickFace fleece technology helps you not to over-sweat while in it, with any potential moisture draining away through the breathable warm fabric. The jacket has a full-on front zip opening and a zipped chest pocket on one side. 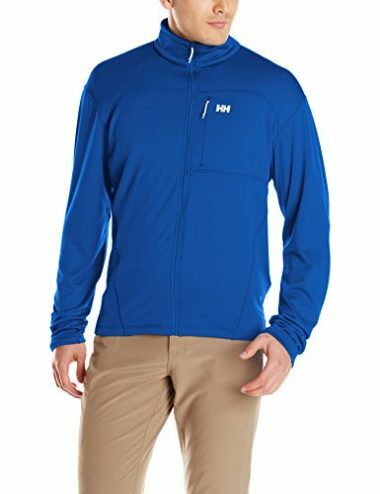 If you’re a bit unsure about using so many layers, this Helly Hansen item should be your first choice. This is the best mid layer jacket that also works as a top layer, effectively providing both insulation and a waterproof protection. 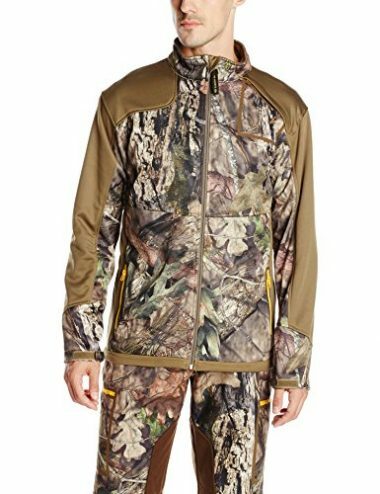 If you’re a fan of other clothing items from this brand, then you should know that the zipping mechanism makes it compatible with them (especially with softshell jackets). Still don’t know which of the above options is the best midlayer for you? Here are a few more considerations to have in mind. A breathable, high-quality fabric will allow your mid layer fleece to keep the body heat in but still regulate it a bit. When you get too hot, taking your mid layer off shouldn’t be the only option. If it were, you would soon be stuck in a vicious circle of getting cold and hot and so on. The different layers worn by outdoor adventurers (bottom top and mid layer) are made from different materials, which provide an unique kind of insulation. When it comes to mid layers, their type of insulation should be the highest, as their main job is to keep you warm. However, it should also be a breathable fabric. All of the best midlayer options in our top fulfill this condition. The best midlayer items on the market are made of a highly breathable fabric, even though they retain the heat so well. If the mid layer fleece fabric isn’t top notch, you will start sweating soon and there’s a risk for catching a cold. A matter of personal preference, of course, the style of the best rated mid layers can differ. Some are plainer, some are elegant and clearly thought out for urban use, while some support a sports team or some other athletic effort. For urban use, you can get away with a loose fit in your mid layer. But if you’re looking for the best mid layer for skiing or other winter sports, you need to choose a more closely-fitting one. The cuffs and the collar should be tight as well, for preventing heat loss. Extra features could come in handy, depending on where you plan to wear your fleece. The best mid layer jacket for you should have some solar protection, for example, if you’re going skiing, or lots of pockets for your valuables, if you don’t carry a bag. Most of the best midlayers available are quite lightweight, in spite of providing a lot of warmth. Some are more heavy-duty than others, though, especially if they are designed for winter sports and outdoor adventuring. For camping in winter, you need your items to pack easily and not weigh a lot, either. The best midlayer jackets on the market tend to score highly on both those counts, unless it’s a 2-in-1 option that naturally weighs more and takes up more space. Q: How To Wash A Midlayer? A: There is no universal answer here, but each mid layer fleece comes with detailed washing instructions. Follow those and you’ll be fine. Q: What Type Of Activities Require Layering With A Midlayer? A: Anything done outdoors during winter time or simply cold weather, from jogging around town to ice fishing or winter hiking. Q: How Does Layering With A Midlayer Work? A: Different fabrics provide different types of insulation, and layering is the key technique to keep in mind for combining them for the best. The bottom layer when venturing outdoors in winter should be based on wool, like a Merino wool T-shirt, for example. The mid-layer should be the layer providing the heaviest insulation, so it should be synthetic. Lastly, the top layer should be waterproof and windproof. Once you will master the layering combo in winter clothing, you’ll see that nothing stands in the way of you and the outdoor adventure you yearn for. From skiing to camping or snowboarding, our top of the best midlayer clothes has a great option for everything. Outdoor Safety in Winter Weather Tips, CDC.gov. Staying Warm in Winter Guide, Nidirect.gov.uk. Do you use midlayers yourself, either for hiking and outdoor trips or during cold times in the city and everyday commuting and travel? What kind of midlayer do you prefer using? Which one from our list of the best midlayer jackets would be your first pick? Feel free to share your experience with the Globo Surf community in the comment below. After all, learning pro tips from each other is the best way to prepare for outdoor adventures!